At 1:30am this morning my wife woke me up. My sleep addled brain slowly came online, registering what she said to me. I cast a quick glance at the digital clock on the nightstand and sure enough it was dead. There was a mild thunderstorm in our area. As I lay there debating whether this required action on my part—again, my brain wasn’t fully activated yet—I heard the faint cry of my UPSs down in my basement office. "It’s been out for about 15 minutes." Ninja like I sprang into action, racing down the now pitch black stair case and hoping I wouldn’t twist an ankle and plunge headfirst to an embarrassing demise: "Local hero perishes in valiant effort to save data" would be an unlikely headline. "Local idiot dives off staircase for computer and dies" would probably be it. You know you’ve been in IT too long when you hear the bleeping of a UPS alarm and have the same visceral response a mom does to a crying baby; "they need me"! Damn, I am such a geek. There are three UPSs in my office, two of them were crying out that they needed power while the third—the one powering my Mac Pro—was silent. I powered down the two machines attached to the other UPSs and looked over at the now completely silent Mac Pro. It’s UPS couldn’t handle the load that long and I had a couple of external devices sucking power off that same UPS as well. 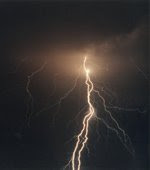 A silent white flash outside, followed a few seconds later by the rumble of thunder simply set the moment. Man, I hoped I had saved everything important and that Time Machine wasn’t in the middle of a backup when it died. Apparently the power came back a couple of hours later. When I did finally wake up I was greeted with what seemed like dozens of flashing digital clocks throughout the house. I love that engineers put digital clocks on ovens, microwaves, coffee makers, etc. I just wish they would put friggin batteries in them too. I powered up the Mac Pro and started in for the day. I opened up Console.app and scanned through all of the entries. I didn’t see anything noteworthy and after firing up a few applications everything seemed fine. If you are ever curious as to what your machine does when it starts up fire up Console, click on Show Log List and then click on All Messages right after boot up. Lots and lots of information in there on what’s really being loaded up. I can only assume that since the machine did not shut down in an orderly fashion that something was left in an open state and now backupd needs to ensure everything is okay. The backup ended up taking about 30 minutes instead of the usual 2 minutes. What I really need is a UPS that can talk to my Mac Pro. The UPS I have attached to it now is a legacy from my Windows machine: a Tripp Lite Omni VS1000. I’ve had really good luck with Tripp Lites and would be quite happy to keep using it but unfortunately I didn’t find any Mac specific software that would enable me to use it as anything more than a battery backup. Ideally what I want is something that can communicate with the Mac. Being able to read power levels, get warnings of a low battery that needs to be replaced and the ability to send a signal to the Mac to gracefully shut down is perfect. In my brief searching this morning I could only find older references to Mac specific UPS software and devices, so I’m going to ask you: Any recommendations for a decent mid-range, desktop UPS that has OS X compatible software? If someone is aware of good third party software for driving a Tripp Lite from OS X that would be even better. Next time the power drops in my house I’d really just like to stay in bed and know that the machines will handle their own shut downs gracefully.